I've been trying to figure this out for a bit but everything I've tried doesn't work. 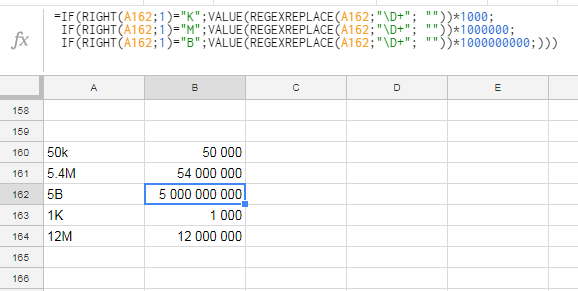 A quick search brought me to the conversion from full number format to condensed format (5,000,000 --> 5M; 50,000 --> 50k), however I need to do the reverse conversion (5.4M --> 5,400,000; 50k --> 50,000). I'm being given in the number in the condensed format with "B", "M", and "k" but I need to type out the full number which is becoming a right pain. Anyone have a formula for this conversion? How to display ZIP codes in Google Sheets?